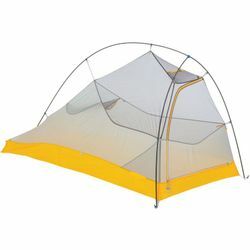 Big Agnes Fly Creek HV UL1 Bikepack Tent. From the award-winning, best-selling line of Fly Creek HV UL tents comes a bikepacking tent designed for on and off-road, two-wheeled travel. The pole segments have been shortened for optimal handlebar, pannier, and saddlebag storage. The burly compression stuff sack with a daisy chain makes storing these tents anywhere, a cinch. Enjoy the comforts of extras like an oversized storage pocket, webbing for dry helmet storage, and all the other features that make Fly Creek HV UL tents the bomb. Singletrack, two-track, and roadie riders rejoice! Our Fly Creek Bikepack tents are perfectly equipped for all two-wheeled, overnight adventures. Don�t hesitate to get dirty. This burly compression stuff sack is designed to withstand all the rigors of trail travel. Use a footprint to extend the life of your tent floor.